Home By Heidi: Is It Christmas YET??? Cookie Exchange PARTY!!! Yay...what could be better than a PARTY!!! I can't wait to kick things off with some YUMMY cookies, Christmas music and Good Friends. I am CRAZY for cookies and this darling box will be my success to the PERFECT Party!!! 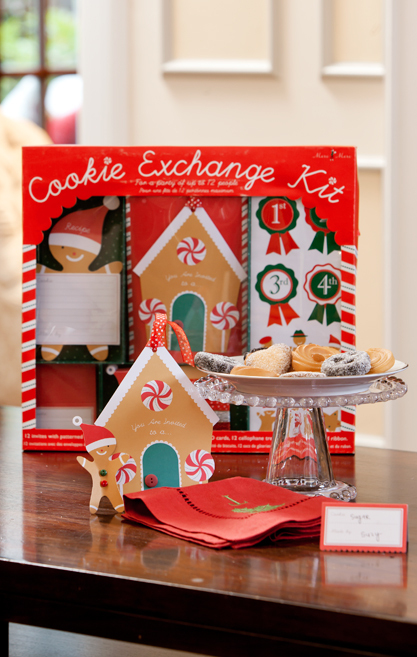 I picked up this party in a box, AKA Cookie Exchange Kit, at my local Idaho or Utah DownEast Home and Clothing where the kits are available NOW!!! Or Buy it online! Check out what comes in your little box of goodness! Ahhhh, I am getting so excited for this party!! i want your house! what i wonderful job you have done!